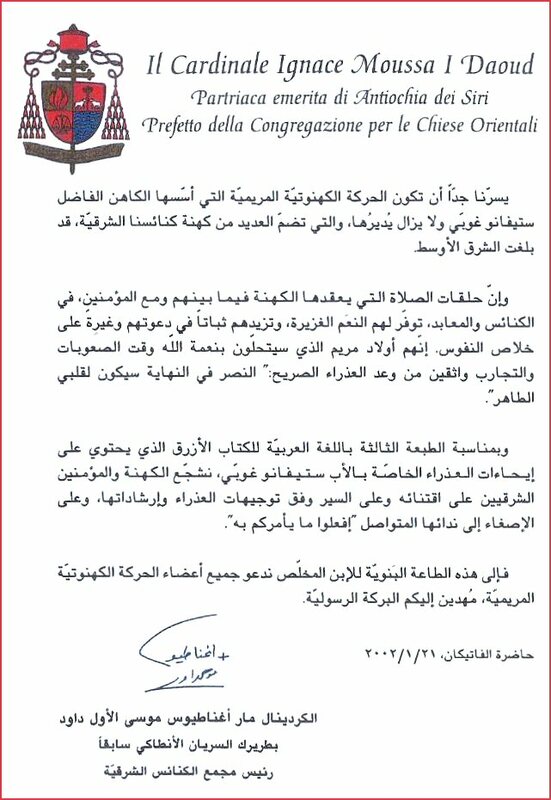 Patriarch Emeritus of Antioch for the Catholic Syrians Prefect of the Congregation for the Oriental Churches. We are very happy to know that the Marian Movement of Priests founded by the Reverend Father Stefano Gobbi, who continues to direct it, has reached the Middle East, and that many priests of our Oriental Churches form part of its membership. The cenacles of prayer that the priests hold among themselves and with the faithful, in churches and shrines, call down many graces upon them, and increase their faithfulness to their vocation and their zeal for the salvation of souls. We therefore invite all the members of the Marian Movement of Priests to this filial obedience to the Son Redeemer, as we bestow upon you our apostolic blessing.